While the world of music bloggers has converged on Texas for the South By SouthWest Festival in Austin (SXSW), I sit alone in a London cafe wondering why I'm not there. I suppose there is a simple answer, I didn't get a ticket because I couldn't justify the cost of a flight (from London) and accommodation. For the moment, you're going to have live the festival through the BBC 6 Music SXSW Blog. To make it more authentic, try buying Tex Mex style Old El Paso Fajitas kits at your local shop -don't forget the extra spicy salsa and get some lime wedges for your bottled beer. If you are there, here's a link to a load of free parties and general what's going on, who's playing etc. hope you're having a great time, maybe I'll make it next year! Once the footage and info starts being posted, I'll sift through and try to bring you some of the highlights. If any of you music bloggers out there want me to give you a shout on this blog with your updates, please feel free. 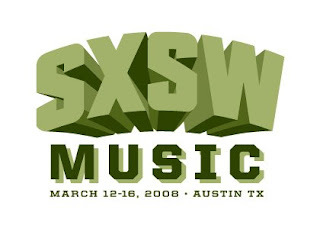 Ioda, the independent music marketing and distribution company, is providing the SXSW Opening Day Bash Sampler 2009 as a free MP3 download. You can find a link to the album here.